Best Target Group for an Event! Home » Blog » Event Promotion » Best Target Group for an Event! The event industry is a $23 bn industry that targets very diverse audience groups across events of varying types and sizes. On one hand you might want to present events that target a demographic that is not adequately being served by your competition. Alternatively, you may decide to present events that cater to some of the more desirable demo groups. If we analyze the below pie chart we will find that the greatest revenue contribution to the event industry in 2012 was from men and women aged 21-45 years, who collectively spent over $11 billion and comprised approximately 50% of total industry spend. However, while men and women aged 21 – 45 years may seem to be the high potential target, one must also consider the types of events that these segments prefer to attend. According to IBIS World report, live music concerts and sporting events have predominantly targeted men and women aged 21 to 45. This has been the case over the past five years because this age group is most consistently employed and, thus, has the disposable income to spend on events. However, the trends have been shifting toward targeting people over 45 who are often more established financially and have more available free time. 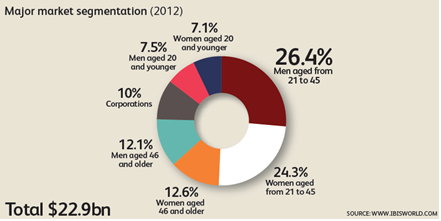 University undergraduates, age 20 years and younger diverge widely in line with the industry’s wide range of events. Customers at sports events are generally male and younger than customers of performing arts productions. The average university undergraduate patron aged 20 – 21 years also attends a number of other arts performances, mainly musical concerts, theater and museums. There is another segment, female, unmarried and older than 35 who also prefer to attend these types of arts performances. There is another segment that we can’t overlook — Corporates. Their support for this industry is usually in the form of purchasing premium seating (or private boxes) or sponsoring events. Corporate interest is most often directed toward large sporting events (which is separate and apart from sponsorship revenue). This segment is estimated to have generated 10.0% of revenue in 2012. Hope you will find this blog interesting and helpful. Please share your comments and thought with us.